Time for another shopHollyDolly update, you guys! Up this week - The Mixer and Spool. The Mixer is an eclectic mix of different beads all strung together. They can include hand painted wood beads, pyrite, turquoise, glass beads, and anything I can get my hands on! Each one is different, and therefore one of a kind! Spool necklaces are really neat, and pull at my little sewing-loving heartstrings. 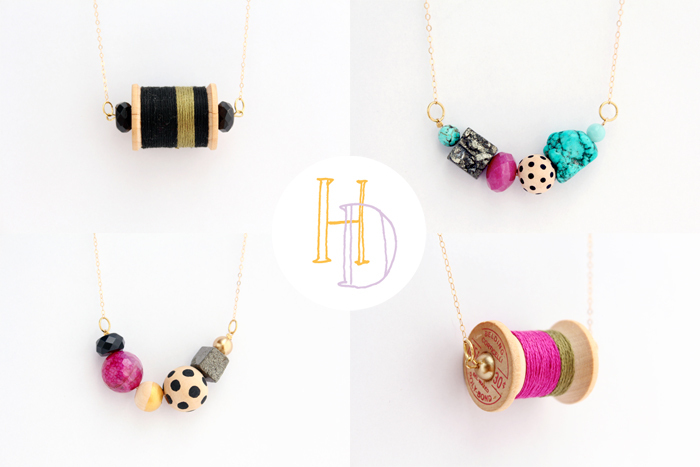 Each is made from a vintage wooden spool, and then wrapped in different color-blocked floss. Perfect for a seamstress or craft-lover! Ah yes, and I also added just a couple more hair bows, as well. Stay tuned next week for another batch of new items!